Thu., Aug. 23, 2018, 9:21 a.m.
CHARLOTTESVILLE, Va. – Speedy wide receivers and a fleet-footed and mobile quarterback have sparked anticipation about Virginia’s offensive potential this season, and a lumbering tight end could also be a part of the Cavaliers’ success. Evan Butts caught 32 passes for 266 yards and two touchdowns last season, some as the second or third option on a play. That makes him the No. 2 returning receiver among tight ends in the Atlantic Coast Conference, trailing only Tommy Sweeney of Boston College (36 catches for 512 yards and four touchdowns.). Butts quickly earned the trust of Bryce Perkins, a junior college transfer and Virginia’s quarterback. That’s great news for the 6-foot-4, 250-pound senior, who has 55 career catches, six for touchdowns. The first sign his opportunities could increase came during spring practice. 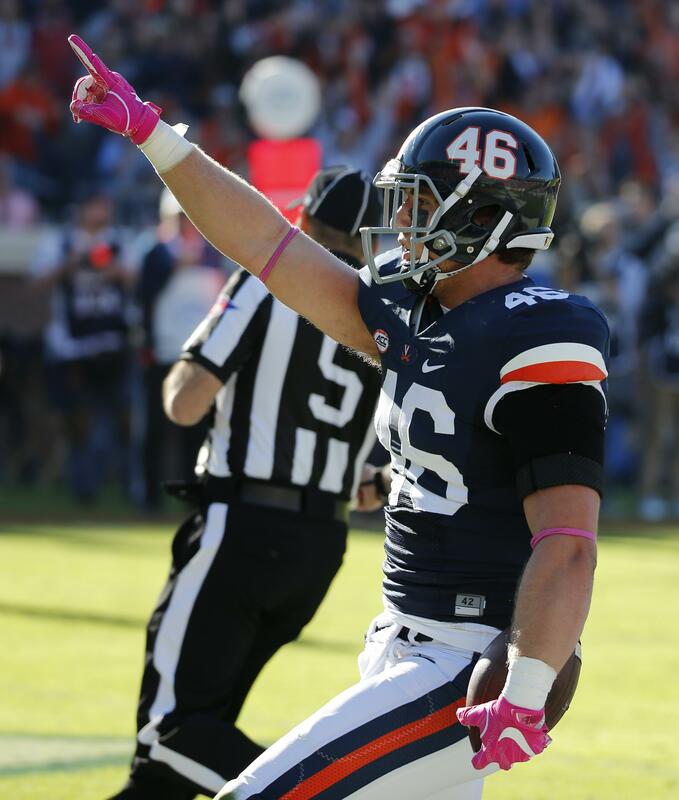 Butts caught just seven passes in his first season under third-year coach Bronco Mendenhall, then nearly matched that with a career-best six catches for 54 yards in the second game last season, a 34-17 loss at Indiana. Finally able to play his preferred dual-threat-quarterback-driven offense, Mendenhall knows Perkins will have a huge safety valve in Butts. It’s a welcomed option if Perkins is under pressure and doesn’t have time to the ball to his speed-burners like Zaccheaus, Joe Reed, Hasise Dubois, or Jordan Ellis out of the backfield. “We have a saying here, or I have a saying that he’s always open it just seems like any time you need a first down and you want to throw it,” Mendenhall said. “So Olamide’s attention with a dynamic quarterback and a downhill runner – if we expand and get a vertical threat on the outside, and then Evan is always open, it starts to make things a little more spread out defensively against us, so that’s the initial direction. Butts enjoyed the past two seasons when Virginia was predominantly a passing team with strong-armed Kurt Benkert, a dropback passer, at quarterback, but loves the possibilities that the season ahead holds. So are the Cavaliers, hoping the difference translates into productivity. Published: Aug. 23, 2018, 9:21 a.m.